It is funnier to have a dock for your handheld, there is no question about it. And there neither any question about there being many alternatives out there, be it for the iphone, the ipad och android, there are a bunch of docks with speakers. But i’ve actually never spotted one with the capability to dock both an ipad and an iphone/ipod simultaneously. JVC plans to change that with their new UX-VJ5 dock. It features dual i-device docks, stereo 15w speakers cd drive (for granny). Also it has the feature to rip cd’s to mp3 directly to usb devices. 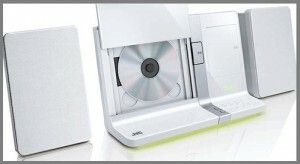 And this docking musical beuty will cost you around 370$ in the end of july (japan). Also it will be available in six different colors! Next: Bloggers Compete, a new way for bloggers to get attention on the web, and maybe even some money!